Find out how this Chinese 'miracle' cure can help you to get rid of back pain in the comfort of your own home. We're all looking and praying for that miracle cure for our persistent back pain right? And that hope gets abused far too often by companies selling us rubbish products and offering treatments that just don't work. So I'm always a bit dubious when I hear about new and alternative treatments for back pain. However, there is a fairly new form of therapy emanating from China that may be able to buck this trend. And it's one that may help your body heal, release muscle tension, reduce pain, improve circulation, and boost your immune system. It's using a TDP mineral lamp to treat people with all forms of chronic muscle pain. And the effects of this over the past couple of decades have been so impressive that the Chinese think of it as a miracle cure. 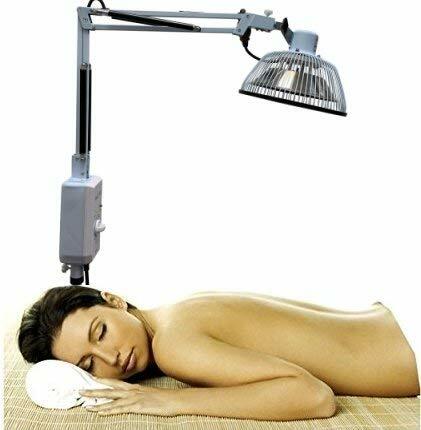 So let me first show you an example of a great lamp that you can try for yourself and then I'll explain how it works and how it can benefit your back. If you are interested in giving a TDP mineral lamp a try then a great choice is the Vita Activate Mineral Heat Lamp. This is a 3rd generation free-standing lamp that has recently been improved and upgraded to the latest technology. So it has a larger mineral plate than most other lamps and contains 33 minerals ready to nourish your body. And it's longer lasting and more durable than most too. Has a larger mineral plate (6 & 1/2") than most other models, which allows you to focus the rays on a larger area of your body. The height can be adjusted to suit your position. While the head is also fully adjustable, so you can always hit the right spot. It comes with a timer so you can set the time of the treatment and it will turn off automatically afterwards. The head has a safety grate on it which prevents any accidental burns from the skin coming into contact with the hot mineral plate. It stands on a five wheel castor base (similar to an office chair) so is easy to move around. And is approved by the FDA. The instructions are not the best (and some are in Chinese!) but it's fairly easy to set up and work out how to use. And to see how easy it is to assemble and use one of these lamps, take a look at the video below. What Is A TDP Mineral Lamp And Why Is It Miraculous? Chinese clay workers. The healthiest manual workers in the world! A TDP mineral lamp is a heating lamp with an iron plate attached to it containing minerals that transmits infrared rays into the body to help with healing and circulation. And they can be a great way to relax and release tension in tight and painful muscles as well as boosting your immune system. Now the back story of how they were invented is an interesting one. So back in 1978 research was carried out on the health of a group of hot clay workers in rural China. The researchers were expecting to find that the workers had a multitude of health problems as they were forced to work long hours in hot and humid conditions. However, the results were a big surprise. Because it turned out that this group of workers were abnormally healthy! As not only were they not suffering from as much muscle pain as most manual workers would be expected to get. They also rarely reported suffering from any bouts of sickness. This flummoxed the researchers until some of the hot clay that the workers were working around was taken away and analysed. And they discovered that this clay was full of beneficial minerals. While the heat radiating from it was giving out infrared rays that were passing small amounts of these minerals into the workers bodies. So it was the hot clay that was working a miracle on the workers health and well-being! Armed with this knowledge Chinese inventors set out to replicate these effects by creating heating lamps that gave out the same infrared rays infused with minerals that had helped the workers so much. So they created a mineral plate for the heat to pass through that was a replication of the exact composition of 33 minerals that were found in the hot clay. And these minerals include all the ones that the body needs to stay fit and healthy, such as calcium, magnesium, sodium, and zinc. So this is how the Chinese 'miracle' lamp was created. These lamps are now widely used in Chinese hospitals and are beginning to be used in the West too by physical therapists, acupuncturists, and chiropractors. And the good news is you can now buy one to use on yourself at home. How Does A TDP Mineral Lamp Work? Do you have the minerals to try a TDP lamp? The TDP mineral lamp works by transmitting infrared heat rays that are absorbed into your body. However, what makes TDP lamps better than ordinary infrared heating lamps is the mineral plate that the heat has to pass through. Because as the mineral plate is heated by the lamp the minerals it contains are ionized and small amounts of them are transmitted with the rays and absorbed by your body. Which helps replenish it's stock, heal, and stay healthy. However, the essential minerals are only part of the story. Because the infrared heat rays also work their magic. As the heat from the lamp penetrates deep into your body (up to 3 & 1/2") getting right into your tight and painful muscles. This loosens up the tissues connecting your muscles and organs and increases circulation and blood flow. By delivering oxygen and nutrients to damaged muscles to help them to heal and repair. And flushing away any trapped waste and toxins that build up inside tight and painful muscles. And on top of that, the heat also strengthens your immune system by giving a boost to your white blood cell count. So the benefits of the heat and minerals together are far better than just using heat alone. Is it starting to sound like a miracle treatment yet? Using a TDP mineral lamp regularly can make a massive difference to your back pain levels. Release tight muscle knots that are a big major of back pain. Help your damaged muscles to heal. Stimulate the body to produce natural pain fighting chemicals. Speed up the body's metabolic processes that promote new cell growth and improves the healing process. Help your body to relax after a long day. And it's also an affordable and safe way to get pain relief at home without the need for painkillers and expensive​ massages. However, TDP mineral lamps are not just good for your back pain. Which is a pretty impressive list of benefits. First things first you will need to give the lamp 10-15 minutes to heat up the mineral plate before you can start to use it. And once this is done you wheel the lamp into position above the bed or couch that you will be laying or sitting on during treatment. Then remove your clothing around the area to be treated so that the infrared rays can penetrate directly into the skin. Now direct the head so it's pointing at your pain area but keep it between 12"- 18" away from your skin. You should feel a warm and soothing sensation as the rays shine on you rather than any burning. And to treat sore muscles and back pain it's recommended to use the lamp for between 5-20 minutes at a time. However, to get the benefits of this treatment you really need to use the lamp regularly. So aim to do this once per day until the pain and soreness subsides and then continue every few days to keep the pain away. Using a TDP mineral lamp is a safe treatment option in general. However, there are certain people for whom they are not suitable. Suffer from neuropathy and can't feel how hot the temperature is. Have implants such as metal, silicone or a pacemaker. Are feeling ill, especially if you are running a fever. And never use one directly on your face or head. And if you're worried about any of these things or using a TDP lamp in general, then it's always best to check with your doctor before you start to make sure it's safe for you. Ok, so I'm going to stop with all this talk about miracles now. Because in reality there are no miracles when it comes to treating persistent back pain. However, the benefits of using a TDP mineral lamp for back pain are great. As not only can it reduce muscle tightness, pain, and inflammation in your back. It can also help your body to heal and stay healthy by boosting your immune system. And they are an affordable option for treating your pain at home that can cut down your need for pain medication and save you a packet on massages. So, if you want to see if the Chinese are onto something, don't hesitate to give one a try.